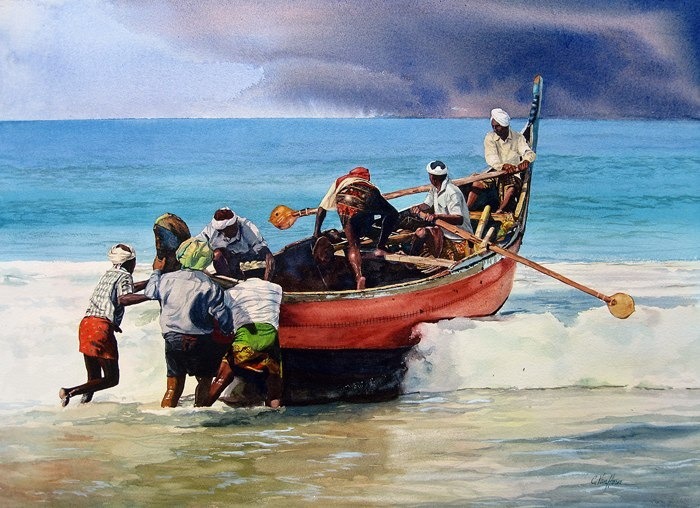 I was honored to have my painting “The Fishermen of Kerala” selected as the best watercolor in the President’s Exhibition- “Best of the Best” at the Salmagundi Club in New York City. It is always a rush when you get chosen by your peers for your work. The exhibition will be open until Friday, April 22. The Salmagundi Club galleries are open from noon to 6 PM Monday through Friday and noon to 5 PM on Saturday and Sunday, but it is always a good idea to call before you come. ( 212-255-7740 ) There is a lovely, colonial dining room where you can have a fabulous lunch or dinner.